Whisker free, pre-flushed and vacuum bagged. 35mm-38mm. 1st quality natural sausage casings. Stuffing capacities vary according to the number of links per pound and how tight the casing is stuffed. Although our natural hog casings are held to firm specifications, there may be a slight variance in stuffing diameter, hence 35mm - 38mm. This may also have an impact on stuffing capacity. Normal stuffing capacity for a hank of hog casings is 100 to 120 pounds or more. Use for fresh or smoked Polish sausage, Italian sausage, boudin,knockwurst, pepperoni, and others. 8/29/2014 – Hello, is this product a 100 yard long? Thank you. 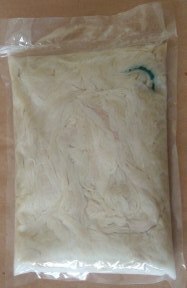 What storage method is reccomended for your natural hog casings and what is the estimated storage life before they . . .